You know my love of string quilts, right? Well, despite having one in progress (one which may never be finished! ), I decided to start another one. I just couldn’t resist using all of the Anna Maria Horner voile fabrics together in one string quilt. I used green for the center string this time. It’s the same green I used for the binding on the last AMH little folks voile quilt I made. And just to change this up a bit, on this version I combined a regular string quilt with a bit of the Denyse Schmidt ‘Any Way You Slice It’ look (pattern available in the Denyse Schmidt Quilts book) . I’m not sure if you can really see it in these photos, but the inside strings are decidedly wonky, and I think it’s quite fun! String quilt tutorial can be found here. For this quilt I’m using 10″ squares. Fabrics are Anna Maria Horner Little Folks voile, as well as the voile solids and dobby dots. Purchased from Fabricworm and Hawthorne Threads. This entry was posted in Posts about Quilts and tagged anna maria horner, any way you slice it, denyse schmidt, handmade, little folks, modern, quilt, string quilt, voile. Bookmark the permalink. Love it! I just began my first string quilt yesterday. It started out as Anna Maria Horner’s “Folk Dance Quilt,” but failed miserably. Nothing would line up right. I think the randomness of the string quilt will serve me better! I’m taking a cue from you, though, and opting for larger squares. I don’t think I have the patience for 400 squares, haha. Gorgeous! Your tutorial is wonderful – I’ve started playing around with string quilt blocks and have decided I’m definitely going to make one! How fun! I was wondering if my eyes were playing tricks on me or if they were indeed wonky. A nice twist on a classic, I’d say! I keep saying it, but I am so into string quilts right now because of you! Thank you!! I think I have 5 started right now and I flip day to day and work on each one. Husband can’t understand why I don’t just finish one. They don’t understand, do they??!! I thought it looked wonkier than usual! Nice change of pace, looking great. Oh my gosh, I adore string quilts (and have used your tutorial before, thank you so much)! I’ve never tried wonky strings before, but I also love wonky. I feel a string quilt coming on…. It looks beautiful! I love the green stripe down the center, and the wonky strips give it so much more movement. Even though the warm and cool colors are mixed up, this gives me such a warm feeling. 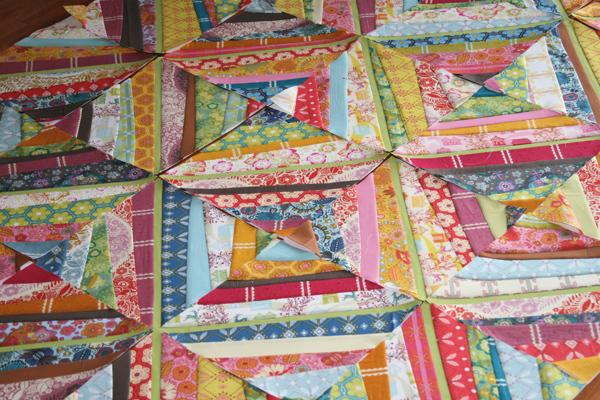 Love making string pieced blocks! That is beautiful! I just love the string quilt pattern. That is very pretty! I am trying to finish my string quilt!! Hopefully you can send some string motivation this way! Absolutely lovely! One day I’m going to start (and hopefully finish) one of these. Thanks for the inspiration once again! Ashley, I just have to say that you have been such a ridiculous (in a good way!) inspiration to my over the past couple of months. I can’t wait to see this quilt finished, and I can’t wait to finally have enough scraps to make my own string quilt. Who am I kidding, I probably have the scraps :p I just need to find room in my budget to get the Little Folks voile. Truly beautiful. I am fairly new to quilting, and had hopes for making a string quilt for my new baby due in May. I was hoping you could help with estimates for the amount of fabric I would need for a crib size. I love AMH and the new voile. Did you just buy a bunch of fat quarters? Oh my goodness – I love string quilts, and yours take the cake. Very nice! Are you kidding me? That quilt is out of this world. Again, another quilt on my must do list. Oh, this is fabulous! I adore string quilts, and have YOU to thank for introducing me to them! I’m a dozen blocks into my first, and having so much fun with the entire process. Well, except for the ironing. C’est la vie. Awww what a pretty little idea! Im due my first child soon and we’re painting her room in soft greens, hot pinks and buttery yellows. I wanted to buy her a patchwork quilt (to have as a wall hanging at first and later as a snuggle blanket) but they are so expensive if you buy them from a shop. The fun thing is though quilting is a family tradition of mine so maybe i should just make my own like you do? I can sew after all! I LOVE the wonky strings! WOW. It is SO SO SO beautiful. So. So. So. The green is perfect! I just finished making some string blocks. So fun. I might try the wonky string blocks. I love, love, love this! So beautiful. All the colors play so nicely with each other and the voile is going to be so soft and snuggly! You are the string queen-inspired me to make one of my own and this makes me think there is another in my near future 🙂 How DO you do it? I’m lucky to “whip” out a quilt in two or three weeks, you seem to get them done overnight! so beautiful! i’m in love with this fabric and your design is great! i’m inspired! 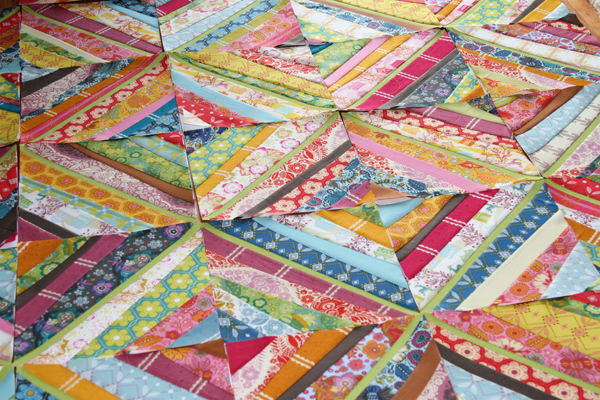 Wow, I never would have thought to do a wonky string quilt, but this is fabulous!! Love it! I think this is going to be simply an amazing quilt. You inspired mine. I love it. Trippy! What a great quilt! i love your new string blocks!! the little folks is gorgeous, and looks so lovely in string blocks!! what a great idea to add some wonkiness to them! I LOVE this Ashley!!! I like how you made each block a little wonky-ish!!!! Girl, you are killing me over here!!! I just love your work!!!! Ashley, I’m starting a string quilt similar to your black/white/blue one. What width did you use for your center strips in this voile string quilt and the black/white/blue quilt? Thanks! Beautiful as always Ashley!!! My DH’s Grandma taught me to make String Quilts years ago, she used newspaper as a backing back then. I wanted to pass on something cheap and easy to tear off that I found to make the blocks. A local store sells a huge box of thin deli paper (something you’d wrap a sub-sandwich in) made by PAPERCON, Inc. It looks like a huge tissue box, you pull out (1) 12″x12″ square at a time – 500 squares for only $5 bucks, can’t beat that. It’s thin but stable enough to sew on – after sewing, I iron the block, square it up, then the paper pulls off as easy as tissue paper. Hope this helps you make your blocks a bit easier. I really, really love this, and I can tell it’s going to be one fantastic quilt when it’s all done. And lucky person, whoever gets it! I love it it is sooo fun the colors are great!!! Everything is so bright and colorful. Even though everything is different it flows well. You said that for this quilt, you made 10 inch blocks. Did you use a paper that is 10 inches? I just finished 140 string quilt blocks. Love the way Anna Maria put hers together. No sashing. Great way to make a dent in you scraps.